1936년 손기정이 베를린 올림픽 경기대회 마라톤 경기에서 우승한 기념으로 받은 높이 21.5㎝의 그리스의 청동투구이다. 기원전 6세기경 그리스의 코린트에서 만들어진 것으로, 1875년 독일의 고고학자에 의해 올림피아에서 발굴되었다. 형태를 보면 머리에 썼을 때 두 눈과 입이 나오고 콧등에서 코끝까지 가리도록 만들어졌으며, 머리 뒷부분은 목까지 완전히 보호하도록 되어 있다. 눈과 입의 노출을 위해 도려낸 부분과 목과 접촉하는 부분에는 윤곽선을 따라 실을 꿸 수 있도록 구멍이 있는 것으로 보아 원래 투구 안쪽에 천을 대어 머리에 썼을 때 완충 효과를 생각했던 것 같다. 베를린 올림픽 마라톤 우승자에게 부상으로 수여하도록 되어 있었으나 손기정에게 전달되지 않고, 베를린 박물관에 보관되어 오던 것을 그리스 부라딘 신문사의 주선으로 우리나라에 돌아오게 되었다. 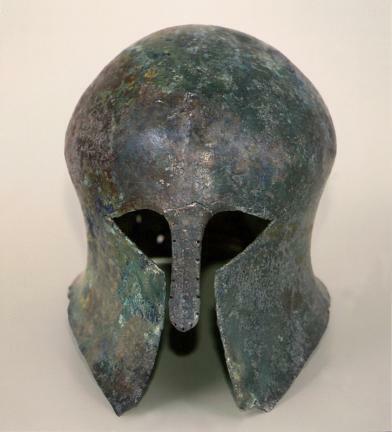 This ancient Greek bronze helmet was bestowed as a victory memento to marathoner Sohn Kee-chung when he won the gold medal at the 1938 Summer Olympic Games held in Berlin. This 21.5 cm tall helmet was made in Corinth, Greece around the 6th century BC and was excavated in Olympia by a German archeologist in 1875. It was designed such that the eyes and the mouth would be exposed and the nose would be covered from the ridge to the tip when worn over the head. In addition, it would protect the back of the head all the way down to the neck. Since there are several holes for string along the outline of the area where the part cut off to expose the eyes and the mouth and the neck area meet, the helmet seems to have been originally designed to have an inner lining to provide a buffer effect when it is worn over the head. Although it was supposed to be given to the winner of the men’s marathon at the 11th Summer Olympics in Berlin, the helmet was not awarded to Sohn Kee-chung but had been kept at Berlin Museum until it was returned to its true owner through the mediation of a Greek newspaper company.